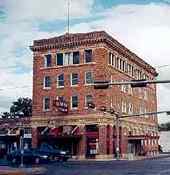 The Aumont Hotel in Seguin, Texas. While the Guadalupe County Courthouse was designed by the relatively unknown architect L.M. Wirtz, the architect for Seguin's Aumont Hotel was the illustrious Atlee B. Ayers, who later designed courthouses for Refugio, Cameron, Jim Wells, and Kleburg Counties (Refugio, Brownsville, Alice and Kingsville, respectively). Mr. Ayers was also The State Architect for awhile and suggested that architects be licensed. Mr. Ayers held Texas Architects License No. 3. 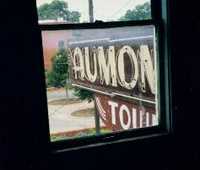 A lot is going on at the old Aumont Hotel. Glamour is being reintroduced. Our recent visit showed the lobby to be sporting a shiny new baby grand piano. The ballroom now glistens and the mezzanine will soon follow. Like the Plaza, it's born-the-same-year neighbor a few blocks away, the Aumont has "chicken-wire" tile and marble on the floor and staircases. This fine detail is also displayed in lobby of Waxahachie's beautiful Rogers Hotel. A photo in the lobby shows a 10 year old girl holding her luggage which is theatrically marked with oversized letters stating: Aumont Hotel. She is facing the camera with an exasperated frown. Abel Rodriquez, who is leasing the lobby, outdoor terraces and the ballroom from owner Earl Seaman, told us that there's an interesting story behind the photo and that the girl was still living in Seguin. It seems that the Chamber of Commerce was holding a contest at the Texas Theater and that every business in town was to be represented by a Junior Seguinite, somehow associated with that business. Since Cliftine was at the peak of cuteness, there was no question about who would represent the Aumont. Plans were made for her to enter stage right, followed by the 4 year-old grandson of the Hotel's Bellman. He was decked out in a gleaming white uniform, carrying the luggage of Miss Aumont, who was playing the part of a sophisticated lady checking into the Hotel. Cliftine was humiliated by having the little boy carry her luggage and was photographed in this mood, just prior to leaving the hotel for the trip to the Texas Theater. Mrs. Dwyer remembers being six years old, and also remembers who won first and second place. First place, she told us, was won by Mary Lee Roberts and second place was Betty Jean Jones. She also remembers that the first prize was a small diamond ring (and that Mary Lee lost it) and second prize was a small add-a-pearl bracelet, that Betty Jean still has. All three women still reside in Seguin. Pride in Seguin runs deep and only after several probing questions, did Mrs. Dwyer admit she was born elsewhere (San Antonio) where her parents, both Seguinites, were working. A photo of the event can be seen today in the Lobby of the Texas Theater. Aumont Owner Earle Seaman gave us a tour of the Aumont which revealed both the quality of the original construction and the detail that's going into the restoration.